A couple of weeks ago I stumbled across a link for a crafty magazine - and you know how I love my magazines! 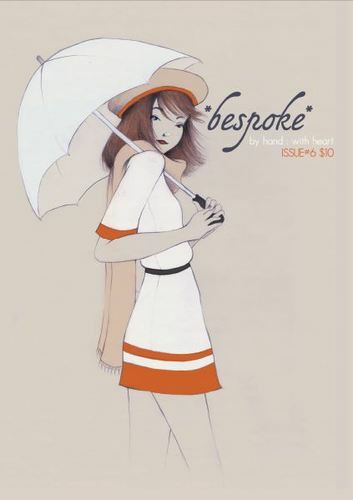 This one is called Bespoke, it is an Aussie indie magazine and available as a PDF or printed. The latest issue has a great range of topics from sewing tutorials to crafter interviews to stories to book reviews to recipes and I must say, it is good to see some male crafters in their too. It has a nice community feel to it. Although I read a lot of blogs I feel like I am missing out on so many other wonderful artistic people out there, almost all the artists featured in this addition are new-to-me and due to the mix of contributors there is a great mix of writing styles. The other plus is that the layout is clean and easy to read. Now, you can pop over and BUY a copy right now or you can win a copy, yes, Jessica has kindly offered to send a print copy to one of you. What do you need to do to get your grubby mitts on a copy? Have you ever had any bespoke item made for you? If so what? If not, what would you like to have made for you? You MUST leave a contact email address with your comment, no email, no win! I will draw a winner at random on May 30th, 9am JST. Jessica is willing to ship worldwide so everyone can enter. I personally would love a pair of bespoke leather shoes... one day! Now, what is yours? Oooohhh, that looks pretty awesome! I'm not sure what a bespoke item would be. Something featured in the magazine? If yes, then I've never had any made for me, and I'm not sure what I'd like made for me since I haven't seen the mag yet... From their blog, I'd like one of those awesome looking handmade soaps. I love handmade beauty products. The price is really not bad for each .pdf issue either! I'm thinking this is something I need to check out. Thanks for the link and the giveaway. I've never had an item bespoke for me. If I did, I would like it to be a piece of jewelry. No, haven't had anything made for me in the bespoke sense. I'd love a really comfortable pair of overalls for gardening with great pockets. oh yes, we are on the same page there! the pillow is a great idea! very stylish it was too! I have had something custom made for one of my children, but nothing for myself. I have been seriously considering having jeans made to my measurements because I can never find a pair that fits exactly right. Tengo 50 añ0s ,hace 26 años entre a una discoteca y vi una mujer con un vestido cruzado en la parte delantera ,la tela era jersey por el movimiento que se notaba mientras bailaba ,el vestido tapaba su cuerpo,pero sugería sin pegarse . ya no tengo el cuerpo para ese vestido ,pero tengo algún vestido parecido,que mis hijas adolescentes quieren. No, I've never had anything made for me :). I'd love cute tote bag (^_^). I forgot about the dress I had made in Israel, so cheap too! Hello there. I'm a magazine fan as well. I've had a few subscriptions on my iPad but I much prefer the real thing... all that papery goodness!! Nothing bespoke for me so far, unless you count my wedding dress? But it wasn't designed specifically for me. my wedding dress I designed myself and had someone make it for me, which was actually cheaper than buying one off the rack and getting it altered - crazy now I think about it. I had my outfit for my daughters wedding made for me in Dubai. I didn't know what I wanted but I knew what I didn't want. After talking to the designer I collected lots of pictures (like this collar, this sleeve etc) and she came up with a design. I wanted a dress and a jacket but also a coat so I could wear the dress and coat to the outdoor ceremony in Scotland. One tailor made the dress and another the coat and jacket (as they had their own speciality). It took lots of visits to the textile souk to get the materials and I took samples back to Scotland and had a bespoke hat made in Glasgow, which incoprorated tiny bits of the dress & jacket material. I was living between the two places at the time so I was back and forward. The dress, coat and jacket fitted like a glove and cost less than if I had picked a 'mother of the bride' dress/coat off the peg. wow, sounds amazing. Feels so good when you have something that is fitted for you properly doesn't it? A tea cosy - not joking. hee hee I hope it is a cute one! that's a cute idea and a nice thing to pass down in the family too. yes, shoes although it would take me forever to decide on a design! I've never had anything bespoke but if I did, it would be a perfectly fitting pair of shoes.